Some of you probably already know, that I released the SCARM v. 1.0 Milestone version in the end of July 2017. Many users were happy to get the new version, but some were not, because there are changes in the licensing model and not all were aware of that. I am writing this post in order to try answering of all questions about the transition to the new version and to clarify the new way that I am taking with the development of SCARM for those who do not follow the posts in my blog. Half an year ago, in the beginning of March 2017, I stated that SCARM 0.9.35 (RC1) will be one of the last beta versions of the program in the post SCARM v. 0.9.35 Released. At this time, I was already not sure if I will be able to continue to develop and share SCARM for free. The truth is that I was believing that more model train fans will support my work and will either donate or buy licenses for the Model Trains Simulator – Power Edition. But I was wrong. In the months from March to July, after I saw that there was no increase in the donations (1-2 per month) and that just a few people are willing to pay for the MTS PE, I decided that SCARM should be turned into partially commercial project. So, in the beginning of July 2017, I announced the upcoming change in the post SCARM Approaches v.1.0 Milestone and explained why I need to do that. In the end of July, I was ready with the first complete production release of SCARM and it was officially published. All details about it are described in the corresponding blog post SCARM v. 1.0 Milestone Released. The releasing of SCARM 1.0 Milestone edition makes the previous beta versions of the program obsolete, so I announced the Phasing Out of The Old Beta Versions of SCARM. The old 0.9.x versions will stop working at some time (not all together) or will become unusable for creating of new layouts and I do not intend to prolong their lifecycle. But don’t worry, your project files are not lost at all. You can always open, review and print all layouts, created in the old beta versions using the new SCARM v.1.0 and that does not require pur­chas­ing of license key. However, if your track plan contains more than 100 tracks and/or objects in it and you wish to continue to edit and save it, you will need to get a license key for the new version. If you already donated or bought license for MTS PE, see how to obtain a free SCARM License Key below. I am very thankful to all of you, who are using my software and especially to these, who helped me with information, catalogs, ideas, tests, corrections, translations and thoughts about my work. A special thanks to all, who shared their track plans and custom virtual objects designed in SCARM with all other users and fans of the program. And one more big THANK YOU to all, who have made donations to the SCARM project or have already purchased license for MTS Power Edition. 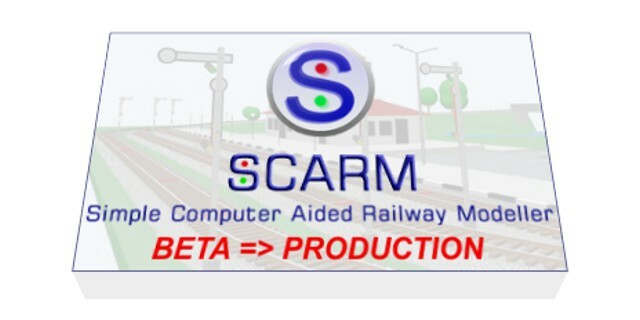 • All Model Trains Simulator – Power Edition users are receiving FREE License Key for SCARM v.1.0 Milestone edition. The license keys are already uploaded and activated in your accounts. • All users who donated to SCARM project will receive FREE License Key for SCARM v.1.0 Milestone edition. Just send me a letter by e-mail to and state the account (Paypal e-mail) from which you made the donation. • All users who contributed to SCARM either with track systems info or major translations of the user interface and the documentation, will get a promo code for discount in order to purchase License Key for SCARM v.1.0 Milestone edition on a reduced price. Just send me a letter by e-mail to and remind me when and how did you contributed to SCARM and I will then issue your promo code. I assume, that some of you may be not happy or even frustrated that I am turning SCARM into partially commercial project, but that is the only way for me to continue to develop the program and to ensure the quality of the product and its support. I was working over the SCARM project and sharing it for free in the past 7 years and even now, it continues to be free for small and simple projects. But if you want to design bigger and/or complex layout with SCARM, please, support my work and pay the license fee – it is no more than the cost of one or two real turnouts in your preferred track system. Your program is realy fun to work with. I have som old MINITRIX tracks that i planed to sell Before i found SCARM. I now keep most of it for a comming Project. If you want i can send you a bunch of Projects i made just because SCARM is fun to work with. I have made almost every trackplan there. I found it refreshing to work with a software developer that was willing to accept comments, request testing assistance and add track libraries that other layout software does have. Other software expected one to purchase it, even while they are still under development. Thank you, Milen for creating a wonderful tool for model railroading at a very reasonable price. using your great track planning software tool for quite some time, I have nearly completed now a nice and very detailed 6,8 sqm Märklin HO K-track layout plan including base construction, landscape, signals, lamps, buildings and roads. I am also ready to share my layout plan here for inspiration of other SCARM users. Before I buy a license key for the 1.0 version, I would like to know, if this version offers the possibility to not only print the tracks with their center line but also lines right and left of the track for cutting the track support from wood. I need that because I would like to cut the wooden track support elements directly from the 1:1 print-out. There are no changes in the tracks drawing procedure in this version. However, there are many ways to achieve what you want even now. Press “T” key one or more times to adjust the way tracks are drawn in 2D. You can select between center-lines, rails and outlines (along sleepers). Also you can use “B” key to see the roadbed mask, which is wider. And finally, you can set all tracks to be on a bridge mode while printing – that is even wider and will allow you to cut the wooden track bed. thanks for your feedback. The bridge mode option is a great idea, indeed, for what I would like to achieve. I will try that one. Jorg, I already sent you 3 e-mails, but you do not reply. Please, reply to my e-mails or send your request to . If we cannot reach each other by e-mail, I am unable to help you. Hi Milen, I know what it is like to develop for free and receive only a few donations per month – if at all – from the people that enjoy the software. In my case I stopped altogether as I could no longer afford to make time for it. So I’ll be happy to support you. Just one major question: the beta allowed editing the libs in notepad which I needed to do to make the LGB tracks fit together as they do in the real LGB track system. Will you support this again in the future? As a reference I encountered problems with the R2 radius and the crossings for which I created my custom objects. Unfortunately I now need to copy paste them from old beta projects since my customized library is not loaded anymore.. The licensed version of SCARM can load the libraries in the old text format. If you think that something in the default LGB library may be wrong. let me know and I will check that. The “Tcrossrail” K-30 doesn’t fit either as it should in the LGB system. I changed the angle to 28.5 degrees to make it connect to adjacent rails but it must be the last part placed, or it will cause other problems. I didn’t work with R3 etc. Is this license key good for current version or for a few years and need to be purchased again? of is it a lifetime key? Love what you have done and will be purchasing a key soon. The license key is usable for the current and all future 1.x.x versions of SCARM. It will not expire. However, if and when version 2.0 becomes available, a new key may be needed for it. You will be able to upgrade your old key on a reduced price (if you wish) or you may continue to use the key with versions 1.x.x. in that when I go to the simulator it still comes up as STARTER VERSION. SCARM License Key covers only the main program. The Model Trains Simulator is extension to the main program and if you want to use the Power Edition, you need to buy separate MTS PE license. See more details here: MTS Power Edition. Yes, there is a free version of the simulator, called Model Trains Simulator – Starter Edition which can work with one locomotive and up to 10 cars. It can work in both free and registered versions of SCARM. Will SCARM work on an IMac? I have an old Dell windows running XP, but the computer is very slow. I am still not able to get satisfying results with a SCARM version working on a Mac platform. It is possible such version to appear, but I am unable to tell when it will become available. If you have Parallels or other similar cross-platform emulation software, it is also an option for using SCARM on Mac. The other solution is Wine, but the compatibility there is limited. I would like to be able to add wiring to diagrams & track insulators to a SCARM diagram. I know for the moment that it is not supported. There is one way I thought of doing it as a work around. That would be to define 2 layers, one for wiring and the other for insulators. For wires I could simply draw straight line segments, if possible with curved corners, for the insulators I could draw small arrows pointing to the correct side of the track. The problem is that I can’t figure out how to draw simply connected line segments, with or without rounded corners, nor how to draw arrows. Can you help ? I you would have any other suggestions to the above, I would appreciate it. The only way to draw something like wires in SCARM is to use the figures. You can use narrow and long rectangles for each wire (and probably you will need several for each wire in order to represent its horizontal and vertical segments) or you can use polygons drawn in shapes like wires. You do not need to have Paypal as we accept all major credid/debit cards. Please I have a problem. I need house SCARM on a dedicated computer with XP but this machine don’t have a possibility to connect by Internet. May I download from a Mac in a key and then transfer the program in the old computer? I am sorry, but this will not work. The key activation must be confirmed online on the PC with XP.